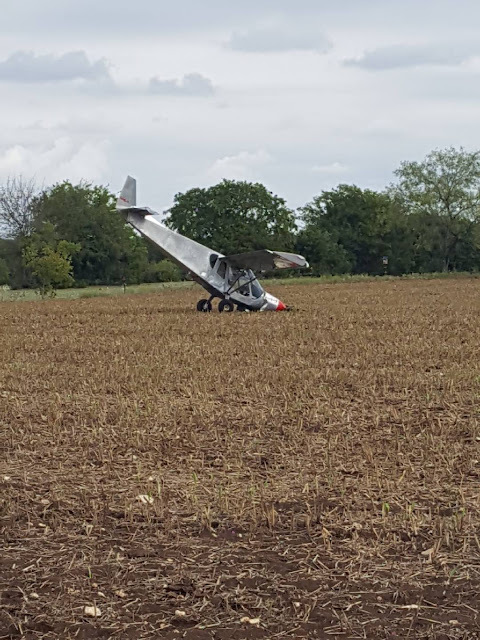 On September 10, 2018, about 0845 central daylight time, a Lynch Zenith 750 experimental amateur-built airplane, N946JY, impacted soft terrain during a forced landing following a partial loss of engine power during initial climb near Temple, Texas. The private pilot sustained minor injuries, and the airplane sustained substantial damage to the fuselage. The airplane was registered to and operated by a private individual under the provisions of Title 14 Code of Federal Regulations Part 91 as a personal flight. Day visual meteorological conditions prevailed at the time of the accident, and no flight plan had been filed. The local flight departed the Draughon-Miller Central Texas Regional Airport, Temple, Texas. According to the pilot, prior to takeoff, he completed a preflight, engine start, and two engine run-ups. No abnormal engine indications or anomalies were noted during those tasks. Shortly after takeoff about 400 ft above ground level, the engine began to vibrate, and a loss of power was noticed by the pilot. The pilot applied carburetor heat and no change to the engine was observed. Due to the low altitude, the pilot elected not to make a turn back to the runway and to execute a forced landing to a field that was in front of him. The airplane touched down in a soft field, and the nose gear collapsed. The airplane skidded about 20 yards and came to rest upright. The pilot departed with about 24 gallons of fuel in the fuel tanks. After the accident, no fuel was found to be leaking from the airplane. The pilot reported that there were no mechanical malfunctions or failures with the airplane. The pilot stated the Federal Aviation Administration (FAA) inspector examined the engine and did not find any anomalies that would have precluded normal operation.